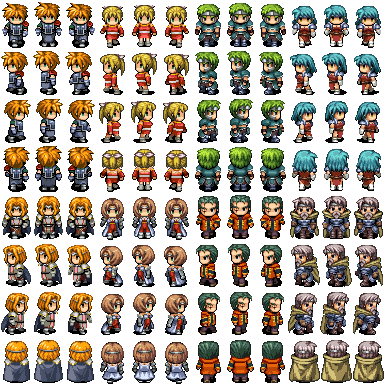 I'm currently looking for a retro-rpg-ish character sprite to be used in the tilemaps sample project. Something like this, you can find lots and lots of examples when googling for RpgMaker resources. However, I haven't really found any sprite where (a) licensing was clearly defined and (b) compatible with the MIT license. I'd happily pay for a sprite as well, but unfortunately, most of the providers do not allow you to re-distribute that sprite (in a readable way) - which I need to do since it's for a freely available sample project. 4 to 8 directions. Four is enough, but eight would be awesome. Walking animation in each direction. The classic "three frames" would be sufficient, but finer-grained animation would be a bonus. Compatible with an MIT license for public release. If anyone has an idea where to find something like this, let me know. There's plenty at opengameart.org, and most of them have rather permissive licenses. For example, this seems to be a high quality one (it's 64x64, but the actual character is smaller, I suppose it fits on the 32x64 size as well). I've searched opengameart something like a week ago for a few hours, but honestly I'm not sure anymore whether this is a good source in this case. For example, the character you linked is part of the Liberated Pixel Cup project, which uses some kind of dual-licensing. However, one half of that license model is GPL, which is a copyleft license, which could, in the worst case, require me to license the entire Duality framework as GPL as well, and in turn all projects done with it, and so on. Which is why I'm not touching anything that has GPL on it. Some others, like this one or this one are looking good license- and graphics-wise, but are far too small, so I can't use them either. Well, I'm no way a license expert, but on the OGA page, left side there are multiple license stamps. According to Wikipedia, multi-license means that it's the recipient's right to choose between the licenses. And the CC-BY-3.0 listed there enables building upon the material, as long as you provide attribution, without other restrictions. I agree with you that it should be fine to use these dual-licensed works, but I can't really say for sure that I won't accidentally stumble over some legal detail I had no idea about. I don't think it's really that complicated and I believe that there wouldn't actually be a problem - it's just that suddenly being sucked into GPL-space is nothing I'm looking forward to and I don't really want to be in the same room with that potential risk. Me neither - and that's kind of the problem here. Also, I might be a little over-protective here, but as you say, better safe than sorry. EDIT: I believe you can use these? I know! There is really a lot of content that's RpgMaker exclusive, even though it can be bought independently. I can get behind applying that rule to free material, but if you buy it as a separate package? ...it doesn't seem like I can. If this is a derivative work of the RpgMaker content, I guess that's still bound to the RpgMaker platform.